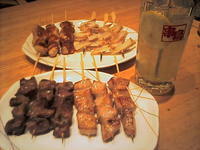 I'm going to go to my favorite yakitori restaurant tonight. It's called "Toriyoshi." i can't wait! 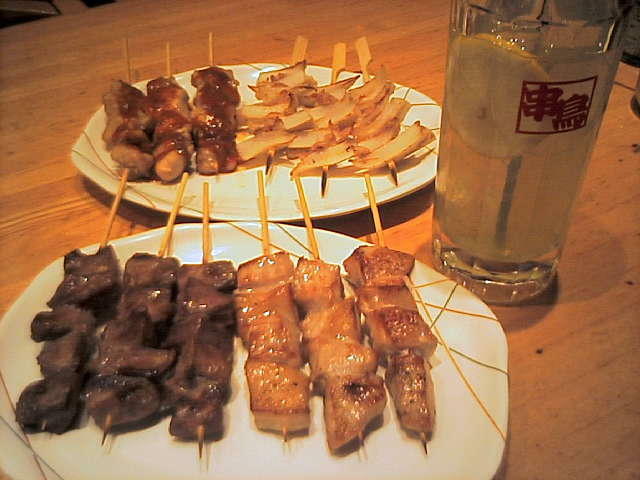 Ohhh...I really like yakitori. It is much better than tendon! Reading your blog is making me hungry! in india da legal age to drink iz 18 lol...n yea wen i come to japan ill b sure to try those yakitoris! I haven't been to Toriyoshi. Yakitoris of Toriyoshi are good??? I wanna go there:D!! Did you have a nice time?? BUT I DON'T HAVE MONEY SO MUCH:P I HAVE TO SAVE MONEY!!! 18 years?? Wow!! So early:D I envy you:) Yakitoris are so delicious:) In India, what kinds of food are there? I wanna go Indis someday:D!! In America, the legal age to smoke is 18, and the age to drink is 21. Yakitori looks delicious, by the way! In Japan, it's not so strict for infancy (under 20 years old people) to drink and smoke......I haven't smoked ever before, but I like drinking;D!! !